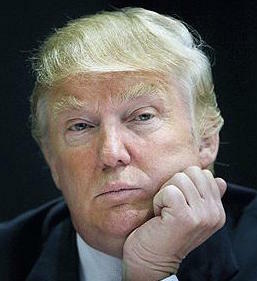 Donald Trump: birthtime June 14, 1946, 10:54 AM, Jamaica NY. One absolutely great thing about The Donald and his run for president is that we have his verifiable birth certificate time of birth. Because of the fracas that he (and others) raised during Obama’s run, it would be wonderful if all candidates had to throw their birth certificates along with their hats into the ring. This would give astrologers tremendous insight as to why the candidates run and who is likely to win. 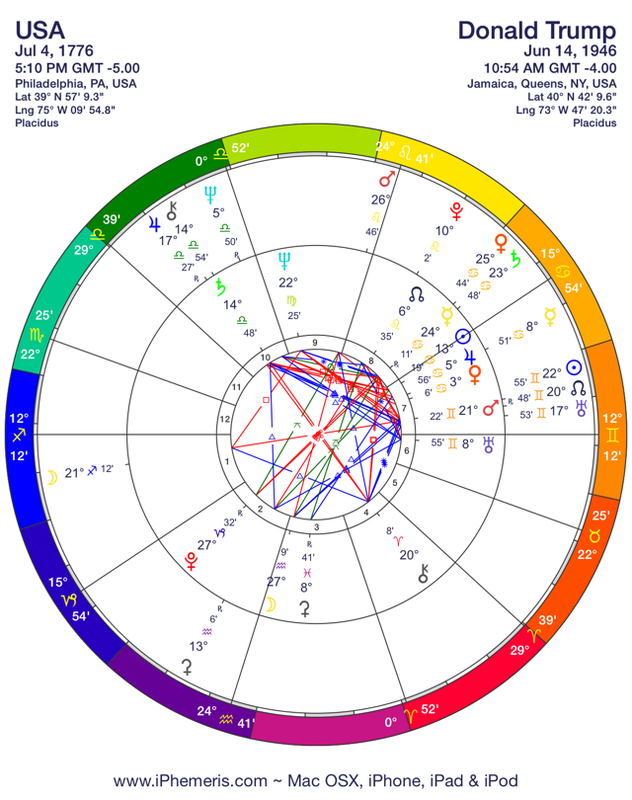 So we can look at the astrology of Donald Trump: candidate for U.S. President. Geminis are not the favorite presidential sign for the U.S., only 4% of the chosen. To really calculate who wins an election, however, we have to analyze what goes on at the time of the vote and the individual horoscope of everyone who runs. As I write this in February 2016, the planet Jupiter (the Great Benefic) transits Trump’s 1st house (his persona/how he appears). Yet, you don’t need an astrologer to tell you that Trump is looking good to his voters now. Where the planets are in the sky today make geometric relationships with a person’s birth or natal horoscope. So a Jupiter “transit” is temporary— and benefits Trump today. 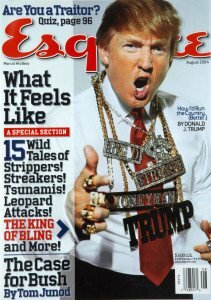 In 2004, when Jupiter last made this pass (and then moved into his 2nd house of $), he was riding high with The Apprentice and launched Trump University. Trump University did not fare well after too many students filed lawsuits. His bid for presidency has a lot of flare but what happens to that juju when he gets closer to the finish line? There are several things to consider. Trump was born at a Full Moon, which was also a Lunar Eclipse- not all eclipse babies have such a dramatic personality, but it does demand one inspect their instinctual reactions. Pay attention to what goes on at the upcoming lunar eclipses this year, because they trigger his reactivity: March 23 and September 16. Trump is not known as a reflective person; he reacts and emotes without censure. In spite of his shtick that he’s a self-made billionaire, he benefits from luck and a willingness to say whatever is necessary to get his way. If he were someone who had a willingness to analyze his foibles, he has great potential to serve in community-building. But at this stage in his life, the likelihood of that occurring is slim, especially if he wins with a platform that promotes his grandiosity, bullying and lack of compassion. With Venus/Saturn in Cancer in his natal chart, emotional security is essential for his well-being, but not easily won. 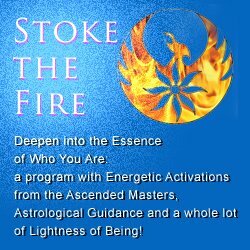 Venus reflects how we love and attract abundance; Saturn symbolizes limitations and fears. When these two planets are in alignment with one another, the individual feels limits on love. His means of achieving a sense that he is deserving is through an unrelenting need to be right and have the last word. He is driven by an inherent sense that there is not enough love/money and whatever he gets is not what he deserves. All the bluster points to inner insecurity. Those in psychiatric professions call him a “narcissist”. According to Pew Research, the U.S.A. has had its share of narcissistic presidents. Of greater concern is his unwillingness to listen. With Mercury (the communicator) in a challenging aspect to Neptune (imagination, fantasy, spirituality) he would do well in regular meditative retreat and reflection. A Twitter obsession does not lend itself to reflection. Instead he surrounds himself in a fantasy of his own making. When confronted with a communication he doesn’t like he responds “liar!” or equivocates. The planet Mars symbolizes desire, passion and drive. Not surprisingly, Trump has Mars Rising; he is in your face and unapologetic. He is on this planet to assert himself and he does a good job of that. Believe it or not, he is also here to convey a message of wisdom which most of the time does seem to have been swallowed up by his Ego. Extreme self-righteousness is his Achilles Heel. He would shout “liar!” but from a spiritual perspective, he has lost his way. With Leo Rising, his hunger for attention enters the room with his first step. The fixed star Regulus, also rising at his birth is another signal that he projects a sense of royal entitlement. “Transit” is the astrologer’s language for where the planets are today as opposed to where they were at birth. These movements indicate what the heck is going on now and in the future. 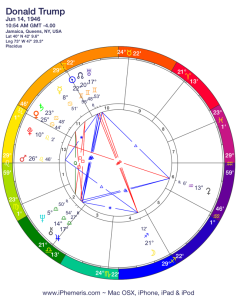 At present, Jupiter by transit may buoy up Trump’s facade– he looks good and projects energy. So far he has just been debating the Republicans and all candidates have come down to his pugilistic style of “debate”. This has little to do with intellectual gymnastics. Donald Trump may mask his intellectual shortcomings with quick comebacks and attacks. This is not to say that he is a stupid person, but with Jupiter/Chiron in Libra and Venus/Saturn in Cancer, he did not benefit from the praise his little boy heart may have hungered for from mom. As a result, bravado and bluster became his smokescreen. Beautiful wives and the art of the deal do not in the end satisfy what he originally set out to do (which may be so deeply skewed that he’ll never manage it in this lifetime). Let’s look at Trump’s connection to the chart of the U.S.A. We can see the harmonious links to Venus and Mercury that have benefited Trump and entertained the public and media. The 7th House shows us intimate relationships: the countries who are our allies and the ones who are our fiercest enemies. Among other planets, Mars resides in the U.S.A. horoscope. Trump’s Sun (self-expression), North Node (destiny point) and Uranus (freedom, change) all cluster on that U.S.A. Mars. In a less pugilistic candidate, I could see these 3 energetic symbols as catalysts for change and inspiration. As it stands, Trump as president would incite and ignite those he considered enemies. He would also easily fall under the spell of those who flattered. Will his glory days end? The big upset for The Donald may be when Mars goes retrograde in mid-April. This suggests that the brakes get put on his outreach and it may even affect his home life. Mars goes direct the end of June, at which time his energy may resurge with even greater force. It’s interesting to note that his mother was a Scottish immigrant with a great reverence for the U.K. royalty. He was extremely interested in Princess Diana, but alas, it was a one-way street. In his book he said: ‘I only have one regret in the women department – that I never had the opportunity to court Lady Diana Spencer’. The U.K. Daily Mail has their own take on this. As transiting Saturn moves towards his Sun in Gemini and Moon in Sagittarius at the end of the year, it’s hard to believe that the presidency is really a role he covets. It is possible that he runs toward it since he feels a pressure to define himself as one who has accomplished set goals. Why a man with unlimited financial freedom who seemingly answers to no one would accept the harness of a bureaucratic institution is either total hubris or a real desire to serve. However, the Saturn transit pretty much guarantees that even if he were to win, by 2017 he would feel a despondency, even depression in his inability to realize goals— not really the ideal state of mind for a new president. I will continue to write about the candidates and timing… your thoughts are most welcome. Very interesting story. I would not like it if he became the president, I dont think he is fit for the job. Then again, Hillary might be even worse. At this moment I am still hoping for Bernie Saunders. Would be a change if it wasnt about money this time. thanks for your thoughts, Jacob. I will write more about all the candidates and the possible outcome. How about an update? Here it is the middle of July and he is now the Republican candidate. What the heck is happening to the USA? The USA is going through the expected revolution as it goes through its Pluto return – a slow-moving planet and a slow painful process. What cannot be predicted is HOW the revolution occurs. Certainly Trump’s dismantling of how a candidate runs is part of that. Keep us informed of your ways of thinking. I don’t know if this feeling will continue to exist but I am curious. Express whatever you feel to express. I am interessed. Can “humans” be so naïve and act as if their decisions had no logical consequences !!!??? Is he the King of Terror? Wow, how unfair. 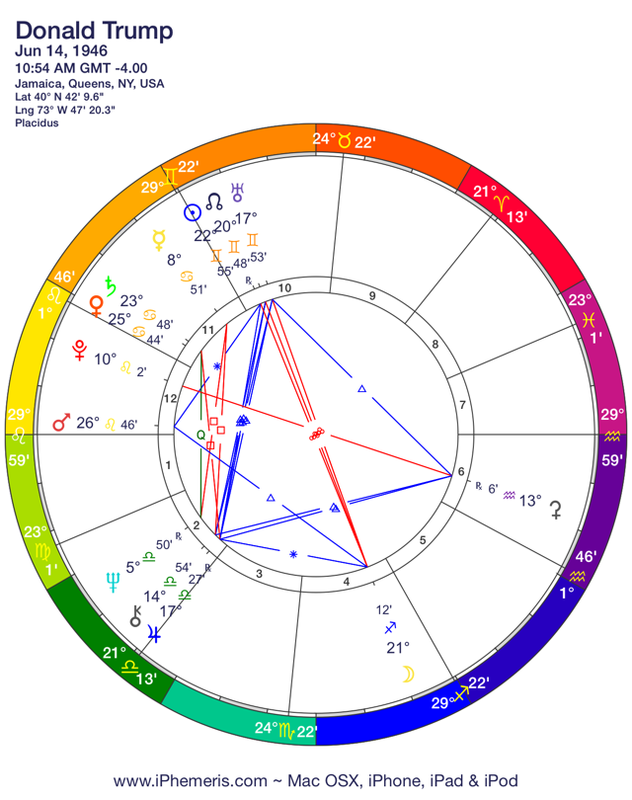 Trump has Venus and Saturn conjunct. I find that to play out as someone who’s self-judgement and moral compass is tied to beauty, love and the beautiful things in life. He is going to make it his very “job”, his mission, to make this country great again. He also has Pluto in the 12th house. Strong, unbreakable will and the power to create with his mind, also many many hidden enemies that God vanquishes for him, sometimes without his lifting a hand. I’m Black- I followed the election closely and I saw how every single day, the media tied Trump to racism, violence or lying. Every day. And when they couldn’t tie it to him by any stretch, they used his “supporters” to make the link. This is the same thing the media did to my people. Make every story about Black people something to do with violence, poverty, dysfunction or degeneracy and after years and years of doing this, you don’t even have to say Black anymore, all you have to say is “gun crime”, “Welfare”, “Single mother headed hoseholds and everybody knows you are talking about Black people. I have the 12H Pluto aspect as well. There’s a protection over me and I find help whenever I need it, from people I don’t even know sometimes. Trump has the same thing. He’s a good person being maligned and he will be vindicated. The sabotage planned against him won’t work either. Thanks so much for your perspective. You are right that Venus/Saturn aspects can lead to self-judgement (as opposed to self-critical) and a moral compass. It is also true that many artists and creators benefit from the discipline that these two planets in hard aspect can bring. But the Achilles Heel is there nonetheless. The true test of Venus/Saturn is self-awareness and self-love, because without it the self-defensive inner gremlin erodes whatever one may accomplish. Pluto in the 12th is extremely powerful. If you find protection over you, it’s because you are aligned with that power – you don’t suppress it. Therefore you are comfortable when you attract situations that demand you step up to it. Trump is now president, and few people have experienced that level of power. Time will tell if he deals with Pluto in the 12th as ably as you do. There are several ways to live and work a horoscope that one is born into – for those who can exercise free will. With Uranus in Aries by transit, we’ve been seeing the effects of social media interfaced with commercial and controlled media. There are forums with rich and in-depth perspective, and I think we all benefit when we read a variety. We will see if more people read and listen more, and we must remember that we are all part of the change. I appreciate your sharing your point of view.